Actor Mukesh is the anchor of Sell me the Answer, quiz show on Asianet. 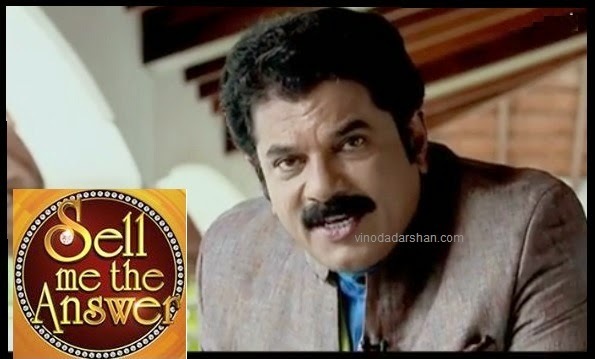 The new show 'Sell me the answer' is a malayalam quiz and game show on Asianet with a format for the first time in malayalam television. Sell me the answer is more about knowledge and skills of bargaining than brain power. This demands a very talented person to host the show. It was known that asianet is going to grab a celebrity to host the show. But now asianet confirmed that malayalam actor Mukesh through the detailed promo showing the registration details of Sell me the answer. This is not the first time that actor Mukesh is playing the role of anchor of television shows. He has become a very popular host to malayali audience through his successful shows Kodeeswaran (2000), Super Talent (2009), Deal or No Deal on Surya TV(2009) and Badai Bungalow on Asianet (2014-still on). Mukesh is now hosting the show Badai Bungalow on Asianet as the muthali(owner) of the house along with a team including Ramesh Pisharadi, Dharmajan, Manoj Guinness, Actresses Praseeda and Arya. This comedy chat show is one of the successful show on Asianet today. Mukesh's show Deal or no deal on Surya TV was also a big success. Stay tuned to vinodadarshan.com for more updates on sell me the answer quiz and game show on Asianet. Asianet is facing tough competition from Mazhavil Manorama, Flowers TV due their new and innovative shows. They are hiring celebrities as judges and hosts to increase ratings. Actor Suresh Gopi was the host of Ningalkum Akam Kodeeswaran on Asianet. Now it is the turn of Actor Mukesh.